Stand Up To Cancer (SU2C) and Beautycounter have come together to honor all who have been touched by cancer. Join us in bringing awareness to the disease, the value of research, and the people it impacts. Every contribution, no matter how much, makes a real difference in SU2C’s effort to stop cancer from taking more lives. Together with Beautycounter, Bushbaby is raising awareness and funds for SU2C to support skin cancer research and prevention. Why is Beautycounter Working With SU2C? Beautycounter delivers on their mission in three important ways: through our beautiful products, education and by advocating for more health protective laws. This campaign is an example of our mission in action. They believe that preventing exposure to potentially harmful ingredients from the products we use every day is simply the right thing to do. At Beautycounter, they've banned more than 1,500 ingredients setting a new health and safety standard—intentionally screening each ingredient used for safety. This is about progress—not perfection. Because every little bit counts. JOIN NOW by clicking on this link below. With every donation, Bushbaby will display a placard in your honor on their store's windows. Come in + let us snap a photo with your placard. We will gift you with Beautycounter samples + offer 20% off any Beautycounter product in-store. Introducing a New Opportunity for Cleaner, Safer Products for our Bushbaby Tribe: our very own Band of Beauty! At the beginning of the year we introduced our new Clean Slate Club: a membership that allows us to help fuel a cleaner, more beautiful life at Bushbaby. With this club we want to help position our Bushbaby tribe to approach these possibilities mindfully, ethically and in conscious balance with our health and the earth. In addition to the Clean Slate Club, we now offer exclusive Bushbaby membership discounts on one of our very favorite brands, BEAUTYCOUNTER! Join our Band of Beauty Now! (Once you find what you like, Sign in as a New Customer, Enter Personal Info and a Password and Become a Member (check and add to cart). We will reimburse your $29 annual membership with a $29 Bushbaby credit! 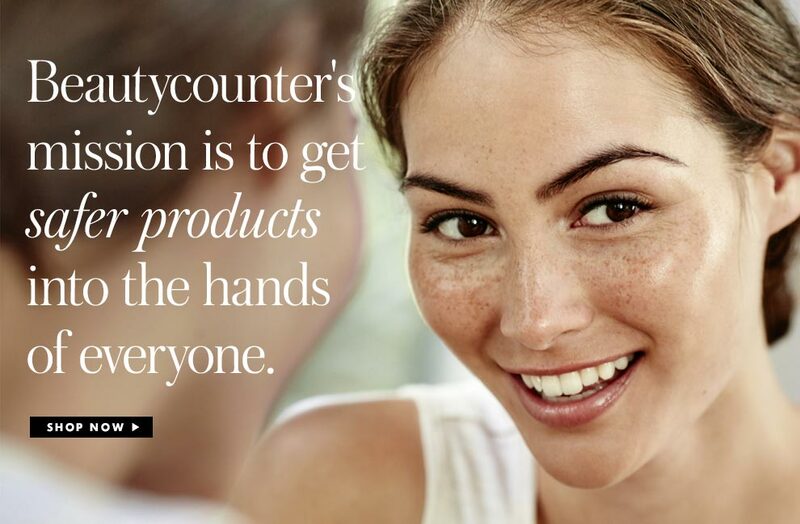 Beautycounter's Mission: To get safer products into the hands of everyone. At Beautycounter, we’re committed to a health and safety standard that goes well beyond what’s required by U.S. law: We’ve banned the use of more than 1,500 questionable or harmful chemicals through our "Never List”—all while ensuring our products perform and that they’re as indulgent as any other luxe shampoo, lipstick, or oil in the market. Making safer products starts with safer ingredients. Beautycounter’s five-step Ingredient Selection Process truly sets them apart. The Never List: 1,500 questionable or harmful ingredients we do not use, no matter what (including nearly 1,400 cosmetic ingredients banned in the European Union). Using the best available data, we screen every potential ingredient, considering it both individually and within a mixture of chemicals, as it would be in a final product. After all, if a company removes one toxic chemical and replaces it with another, nothing has been done to actually protect our health. We regularly review emerging data on ingredients and even commission our own studies. The absence of data does not mean that a chemical is safe. Choose the best available ingredient options. Work to source ingredients from non-GMO, sustainable sources, many of which are organic. Over 80% of our ingredients are natural or plant-derived. Ask for certificates of purity, and test for heavy metal contamination. Work to manufacture all products in the U.S.
Do not test products or ingredients on animals. Every ingredient we use is shared on our product packaging, online, and in EWG’s Skin Deep database. We share the source of all ingredients. As the New Year symbolizes a clean slate and a fresh start, we at Bushbaby are excited to introduce our new Clean Slate Club: a membership that allows us to help fuel an energetic new beginning for you and your family through fun gifts and discounts on clean body care and snacks at Bushbaby. There are new possibilities on the horizon and we want to help position our Bushbaby tribe to approach these possibilities mindfully, ethically and in conscious balance with our health and the earth. January invites us all to make a clean break with the past and set a declaration – for ourselves and our families – that the old way is over. In raising a new generation to love the outdoors and respect nature, we hope you will join us in setting a mutual intention for 2018 to respect nature and our environment with the choices we make…starting with what we put in, on and around our bodies. With this intention in mind, we are honored to invite you to join our Clean Slate Club. The Club is free to join (sign up in the store or with the form below), and members receive a special introductory gift bag, free samples throughout the year, access to Bushbaby’s exclusive BeautyCounter membership, and a 15% club discount on all Erbaviva and BeautyCounter family body care products as well as 15% off all Thrive Life snackies. Were you referred by a friend? If so please tell us who! Would you be interested in further discounts through the Bushbaby Beautycounter membership? Once you sign up (in-store or online), you will be able to enjoy very nice discounts on our top handpicked brands of family body care and snack products. We are fully invested in these three brands because of their meticulous ingredient selection processes, ethical production and business practices, and fully conscious impact on the earth and its people. Read on to meet these wonderful brands. Part of daily self-care is being mindful about what we put in and on our bodies. In addition to maintaining a balanced diet of nutrients and drinking plenty of water, we have to be aware of what products we apply onto our skin. Skin care products and cosmetics can contain toxic chemicals that can be absorbed by the skin. We should consciously choose natural and organic products to consume and to use. Those living the organic life have experienced the human body's amazing ability to heal itself. When we utilize the power of nature, the body works its own magic and we simply inspire positive results. Erbaviva consistently implements sustainable and environmentally responsible principles to create healthy products that better the lives of people while working harmoniously with nature. We source our ingredients meticulously with great consideration of how they are are grown and harvested. From the particular region, to the particular part of the plant, from the health of the soil, to the transparency of the supplier, we know it ALL matters. Each product is crafted with pure living herbs, essential oils and botanicals, sourced near and far, and to the highest standards of organic certification, safety, efficacy and sustainability. It all starts with pure, rich soil, untouched by chemicals. Then add organic, biodiverse non-GMO seeds. Organic farming protects soil, conserves water, and safeguard wildlife. Organic crops are grown and harvested without the use of pesticides, herbicides, and synthetic chemicals that break down plant’s natural defense and compromise human health. Each botanical extract, essential oil and living herb is produced through clean, green chemistry ensuring pristine quality, superior aromas and the highest levels of therapeutic efficacy. Erbaviva creates high quality organic products by infusing organic butters, oils and emollients with pure living herbs, essential oils and extracts. 100% chemical free and never tested on animals we practice sustainability, and social responsibility from “farm to bottle." "Helping families starts with a healthy meal, but our passion for helping people stretches past the dinner table." We send 5% of our profits to developing countries, which means your dinner is helping build schools, empower women, and build communities around the world. No matter what part of mealtime’s most important to you, THRIVE has something great to offer. Use the form above or stop in to join the club and save 15% with every purchase of these amazing brands!